"This is Dexter. He is two. He has a temperament of a Jack Russell, but is very mellow when it's cuddle time. He gets 40-min. daily walks. He sweats like a Crested and is prone to sunburns. He loves rope toys and hates soccer balls (or anything larger than him). As long as he gets his walks he is very balanced. He is very smart and never ever barks; in the year we have had him, we've heard him maybe 6 times." The China Jack is not a purebred dog. 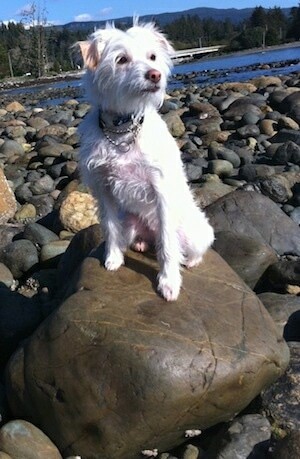 It is a cross between the Chinese Crested and the Jack Russell Terrier. The best way to determine the temperament of a mixed breed is to look up all breeds in the cross and know you can get any combination of any of the characteristics found in either breed. Not all of these designer hybrid dogs being bred are 50% purebred to 50% purebred. It is very common for breeders to breed multi-generation crosses. Scrappy the China Jack (Chinese Crested / Jack Russell Terrier hybrid) at 11 months old and 4.5 pounds—"She is very smart, knows how to shake and loves to fetch. She loves to sleep curled up on your lap. She follows you around wherever you go! She is a fabulous dog, very cute and loving."